Librarian Jason Darling with a screen of images made by Bob Potts. Here’s something for Albany history buffs to look forward to: Thousands of unpublished photos from the collection of the late Bob Potts will soon be posted and available online. 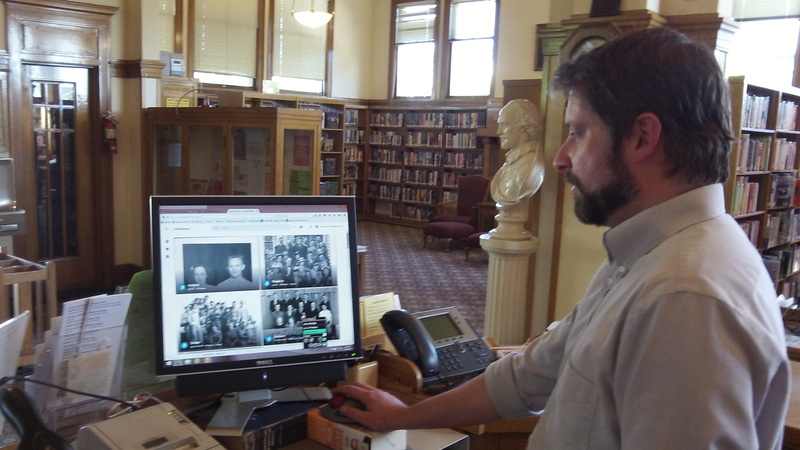 Jason Darling, the librarian at the Carnegie Library downtown, told me about it on Monday. My wife and I had ducked into the library after dinner at the Tacqueria Alonzo for some reading material. (Both the Tacqueria and the library across the parking lot are downtown highlights, and not just because it’s cool inside.) Jason mentioned the photo project when we were checking out. As I understand it, the Albany Regional Museum and the Albany Public Library received a grant for several thousand dollars and used the money to buy an advanced scanner. (I’m a little fuzzy on the exact amount and, come to think of it, the grantor, details I’ll report when I learn them.) Jason says he and LaRee Dominguez, another library staffer, had finishing scanning more than 7,000 of Potts’ photos, and all of them should be available on the library’s website shortly, in a matter of days. Robert “Bob” Potts, who died on Dec. 5, 2007, was a World War II veteran, a businessman and a lifelong Albany resident. He also was a dedicated photographer who from a young age recorded countless Albany and mid-valley images. In the 1990s he published six volumes of photos under the title “Remembering When.” The books may still be available at the Albany Museum and elsewhere. This is great news! I can’t wait to look though the photos online! I am so glad Mr. Potts was able to collect all these photos and the Albany Regional Museum was able to get the grant and digitize them for safekeeping and viewing. BTW, the Remembering When collection is still available at the Museum, and well worth the purchase.